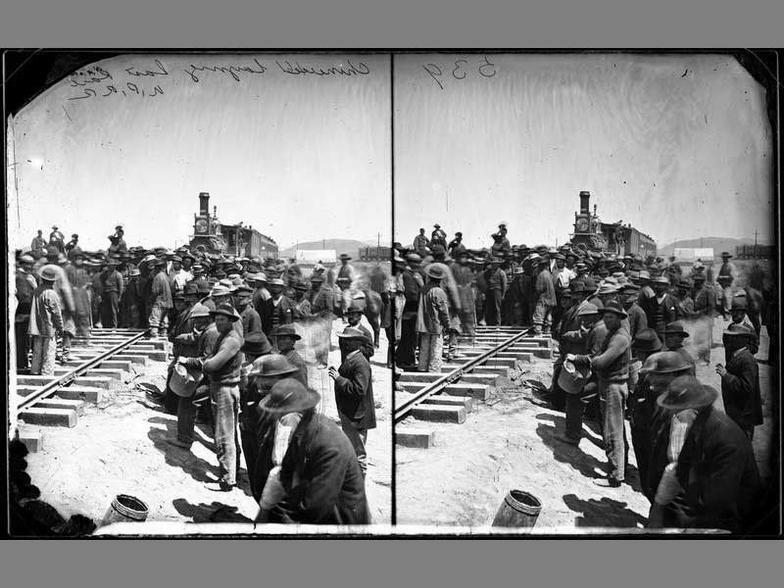 “Official” photos of the driving of the golden spike on that spring day in 1869 show a crowd of congratulatory men in suits and hats. But a modern analysis shows something is missing. The photos of the May 8, 1869, linking of the transcontinental railroad are black and white — perhaps reflecting some of the black-and-white legacies left to us by history. Because what’s not shown, and subsequently neglected for many years, is the muscle behind the miracle. A new exhibit at Utah State University-Blanding focuses on the tens of thousands of Chinese immigrants — the laborers who hacked, pounded, hefted and dynamited to bring the transcontinental race to a finish line at lonesome Promontory Point in Box Elder County. “Tunnels, Trestles, Track,” now open through April 12, features large explanatory panels of the harsh conditions and relentless grind endured by the laborers. There are also artifacts of the material culture — gaming pieces, for example, and engraven rice bowls — they carried with them. The exhibit can be seen in the Health Science Library Building, 576 W. 200 South, Blanding, between 8 a.m. and 5 p.m. Mondays through Fridays. It is free and open to the public. After its stop in Blanding, the exhibit travels in April to the museum at Silver Reef, a ghost town in Washington County, about 18 miles north of St. George. “Tunnels, Trestles, Track” is based on research still ongoing by USU’s Anthropology Department, in partnership with the Utah Division of State History. A Utah Humanities grant funded the exhibit. Ken Cannon, USU’s archaeology director, was awarded the project to document immigrant occupations — “Chinatowns” on the fringes of larger towns — at three different sites along the railroad. After the “Tunnels, Trestles, Track” exhibit’s stay at Silver Reef through June, is can be reserved to appear at other locations, said Cannon. The May 8, 1869, celebration of the 'Meeting of the Rails' at Promontory Point. The photo is doubled because it’s designed for a stereoscope. The photo and antique stereoscope are part of a new exhibit, ‘Tunnels, Trestles, Track,’ created by the USU Museum of Anthropology and now being shown at the Blanding campus of USU-Eastern. Image courtesy of the Collection of the Oakland Museum of California.